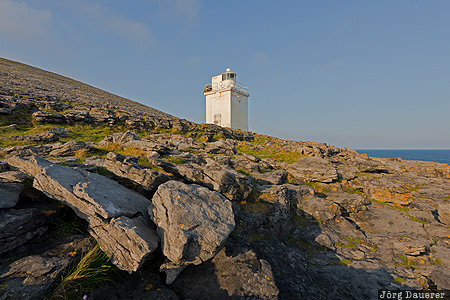 The white Black Head Lighthouse with the typical karst boulders of The Burren in the foreground. The Burren is in County Clare in the west of the Republic of Ireland. This photo was taken in the morning of a sunny day in May of 2016. This photo was taken with a digital camera.